The workers' camps and hostels of early Canberra could be lonely places to spend a long winter's night. It's no wonder, then, that the capital soon had its share of billiard saloons, where men (and it was only men) could spend their evenings. Billiard saloons could attract some shady characters, though. In a government town like Canberra they were bound to be closely regulated. 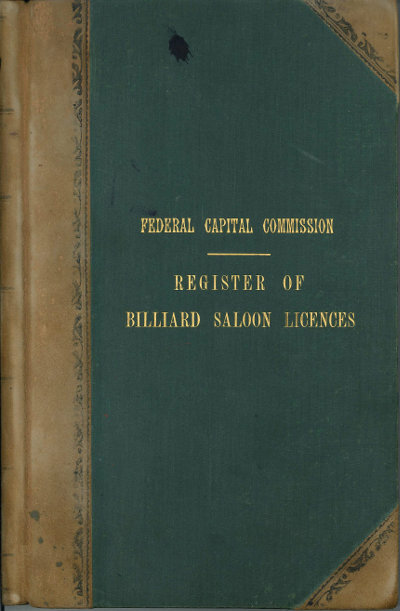 Our recently uncovered 'Federal Capital Commission Register of Billiard Saloon Licences' provides a window into this world, and it is the ArchivesACT Find of the Month. While most ACT Government records focus mainly on the day-to-day administration of the Territory, we sometimes come upon gems that provide glimpses into the lives of everyday Canberrans. 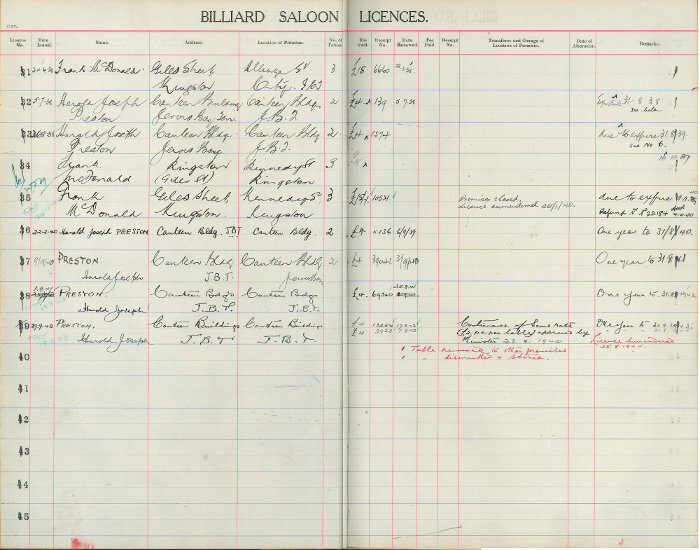 This register lists the names and addresses of billiard saloon licensees as well as the location of the saloons that operated in the Federal Capital Territory (FCT) between 1929 and 1942. The number of billiard tables is also listed for some saloons. With its gold lettering and leather spine, the register has a look and feel that evokes the past in a way a computer spreadsheet can't. 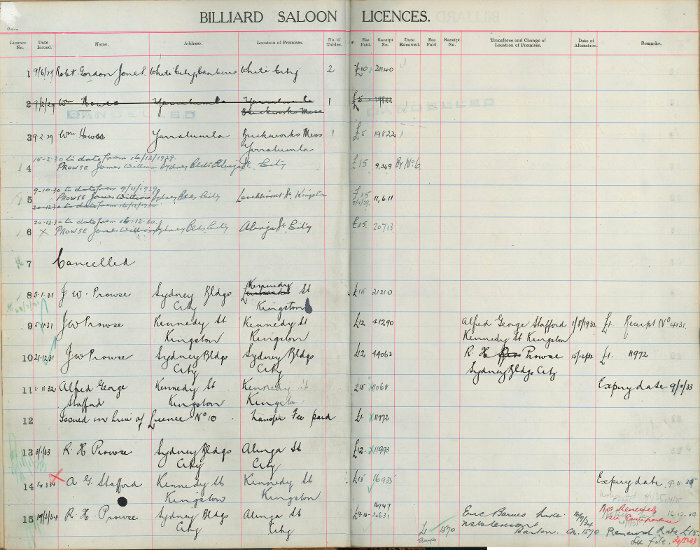 The first license issued in this register was to Robert Gordon Jones on 6th June 1929 for a saloon in the White City Camp. Located near the current ANU School of Music, White City Camp was built as a workman's tent camp in 1925 and stayed in operation until 1931. 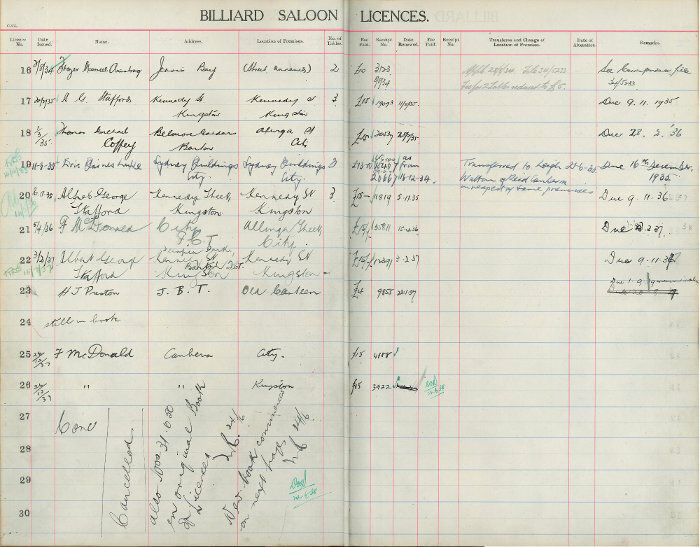 Pages 1 & 2 of the 'Federal Capital Commission Register of Billiard Saloon Licences'. Click on image for larger view. 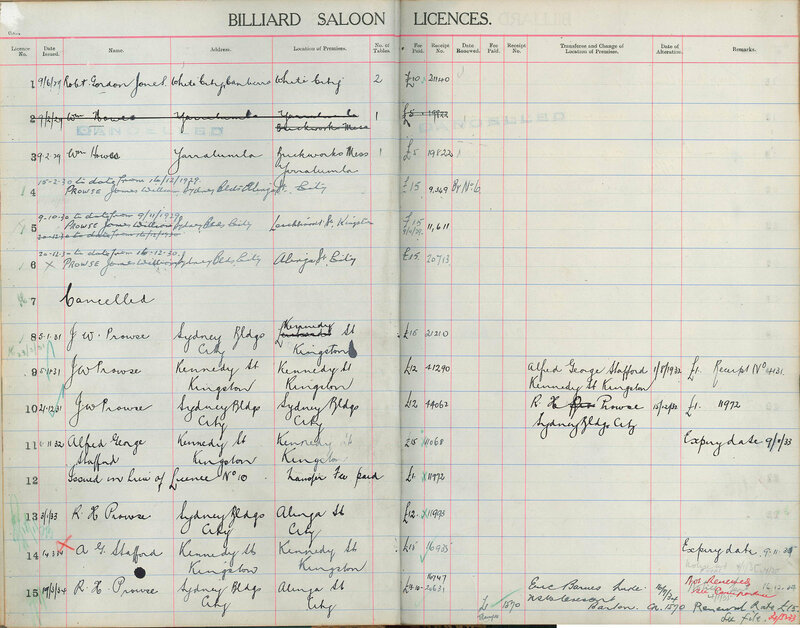 The register also includes an "Application for Licence" and a "Licence to Conduct a Billiard Saloon" for Harold Joseph Preston. Mr Preston, a storekeeper in Jervis Bay, kept a billiard table in the Canteen Store from 1937. This 1943 renewal application and licence relate to the final entry in the register. In May 1929 the Canberra Times reported on two billiards matches "between Walter Lindrum, the world's record holder and contender for the world's championship and Clark McConaghy, champion of New Zealand. "(4 & 5) These matches were played in "Mr Jones' Saloon at Kingston" which might indicate Robert Jones also owned the saloon licensed to James William Prowse on 9th November 1929 (Licence no. 5 in this register). The Canberra Times also ran many advertisements for 'The King of Games Billiard Saloon, Kingston' throughout 1929. The register does not list the business names given to the various billiard saloons - was "Jones' Saloon" a nickname for "The King of Games Billiard Saloon"? 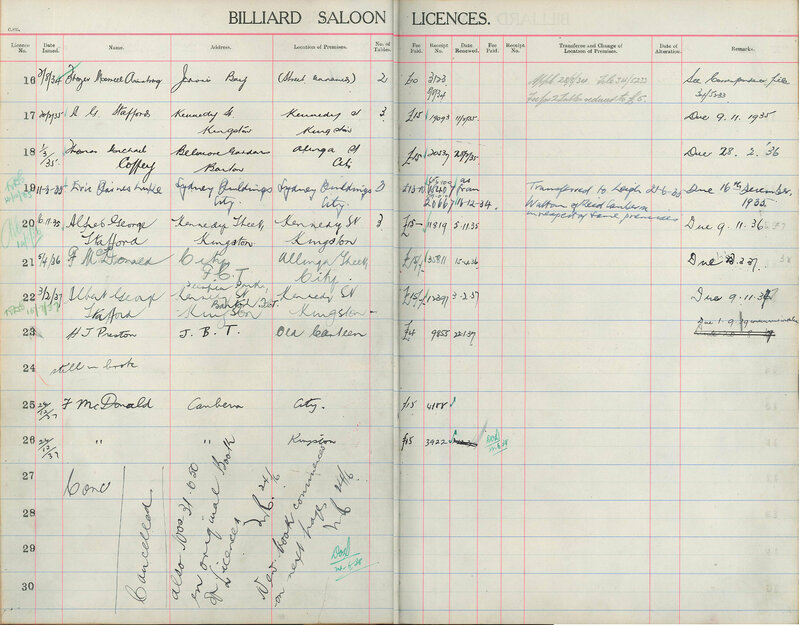 Pages 3 &4 of the 'Federal Capital Commission Register of Billiard Saloon Licences'. Click on image for larger view. "A fit and proper person to hold a licence"
(3) is a fit and proper person to hold a licence under the Billiard Saloon Ordinance 1926. 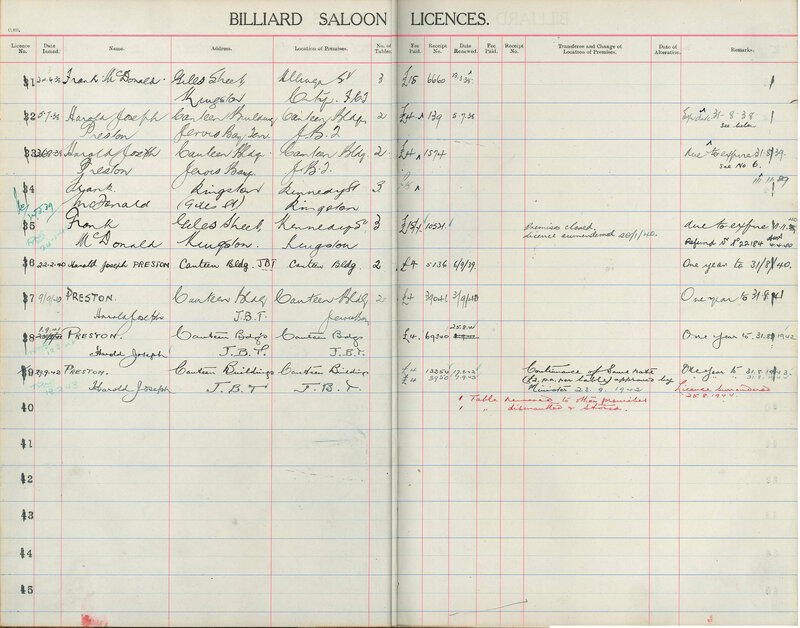 Pages 5 & 6 of the 'Federal Capital Commission Register of Billiard Saloon Licences'. Click on image for larger view. The register gives us a glimpse into the history of the saloon owners and of social life in the 1920s-40s in Canberra and Jervis Bay. Using this register in combination with other internet resources such as National Library's Trove Digitised Newspapers and commercial sites like Ancestry.com helps in providing a more complete picture of our past. Don't forget that August is National Family History Month so now may be the perfect time to start looking into your family's past. Researching family history has become an increasingly popular since the advent of the internet. What once required trips overseas to search local archives has now become accessible from home via the internet.